University of Alaska Press, 9781602231887, 32pp. 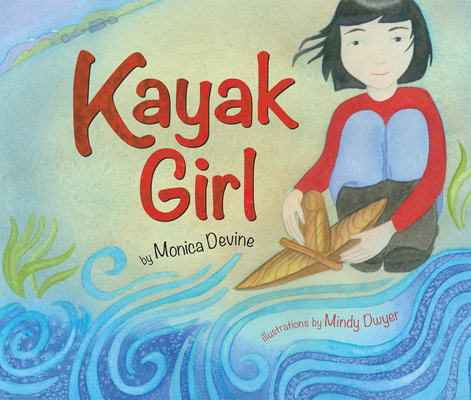 In Kayak Girl a young child learns to cope with serious loss by focusing on something larger than herself. After Jana’s mother dies, she becomes withdrawn. Her grandfather, a carver, pays the girl a visit and finds her unresponsive to his care. He carves a figure of a girl in a kayak and asks Jana to promise that she will watch for the figure after he releases it upriver. Through the following seasons, Jana goes to the river daily and finds strength in the positive memories from her short time with her mother, even as she imagines the distant kayak girl’s struggles. Eventually, they are reunited, and Jana’s spirit is revived. Throughout the book, watercolor illustrations take readers to a magical place along an Alaska river and demonstrate the power of memory and a sense of place in the natural world. Monica Devine is an author and artist living in Eagle River, Alaska. Among her works are five children's books, including Iditarod: The Greatest Win Ever and Kayak Girl, the latter from the University of Alaska Press. "The wonderful, sensitive paintings that illustrate Kayak Girl recreate the beauty of an Alaskan riverside landscape along with the beauty of treasured memories of a mother’s love and care. Kayak Girl is perfect for kids age 7 and up, helping them to deal with issues of loss and restoration." "This is a beautiful children's story that deals with a very sensitive subject. . . . This book provides an outstanding example of the Alaskan culture and traditions. The story deals with feelings in a way that children will understand. I highly recommend this book for children of all ages." "Set in rural Alaska, Kayak Girl is a touching tribute to the power of memories and a grandfather’s love."